Are you planning on buying investment property in Seattle, Washington? If so, you are probably wondering where you can find a good mortgage to finance you rental property. Well, there are a number of investment property mortgage options available. Each of them comes with their own set of features, requirements, pros and cons. That’s why it’s wise to ensure that you know everything about these different mortgages so you can find the best one for you. Taking up a mortgage for a rental property is ideal for people searching for a way to lighten their financial burden. It’s also a way to minimize risks. So, what are your investment mortgage options? Read on to find out. Generally, there are many mortgage options for you to choose from. Knowing how each of them works is the best way for you to find a good and cost-effective mortgage plan. Below is a list of popular rental property mortgages that most property investors in Seattle choose. Arguably, it’s one of the best and most convenient types of mortgages to finance your investment property. Unlike most mortgages, FHA loans come with little requirements, low-interest rates, and easier terms. In fact, the only major requirement worth mentioning is that this real estate investment loan only applies to owner-occupied rentals. This means that for an applicant to get such a loan, they have to show interest in residing in the property. Furthermore, the FHA doesn’t issue the mortgages directly. Instead, the agency insures loans against losses given to applicants by private entities. Therefore, lenders get more incentives and feel safe issuing high-risk applicants with mortgages. And that’s not all. FHA mortgages allow for applicants to provide extremely low down-payments of up to 3.5%. Awesome, right? Unfortunately, due to the high number of applicants for this kind of real estate loan, processing and approval may be a bit slow. Therefore, it’s not ideal for time-sensitive purchases. Another way to finance your purchase is by applying for an investment property mortgage. Unfortunately, getting these loans is almost never easy. And to make matters worse, the costs can be pretty steep. Also, applicants must have enough cash or assets to cover the first six months of the mortgage. Naturally, very few people meet these investment property loan requirements. If you’re lucky enough to meet these, you have to make sure you have less than four current mortgages. That’s because most banks and lenders don’t offer investment property loans to applicants with more than four mortgages. If you are in need of quick cash to buy a Seattle investment property, then a hard money loan is what you need. On average, it takes less than a day to get a hard money loan processed and approved. This makes it ideal for investors handling time-sensitive or urgent purchases. Unlike investment property mortgages, hard money loans don’t have a lot of steep requirements. Basically, anyone can apply regardless of their credit status or the number of mortgages they have. This investment property loan comes with high-interest rates. If you decide to go with hard money loans, you should prepare to pay higher interests. Also, they are short-term. This means that you’ll be expected to repay the mortgage within a short period of time. In most cases, it’s often two to three years. Now, if you are looking for a better alternative to investment property and hard money mortgages, a conventional mortgage will do. Generally, conventional loans are less costly and are tailored to conform to guidelines set by reputable mortgage lenders like Freddie Mac and Fannie Mae. The main difference between conventional and investment property loans is that the former accepts high-risk applications. But the higher the risks, the higher the interest rates and down payment for the investment property, among other fees. Therefore, applicants with unfavorable financial profiles may end up paying more for such mortgages. For veterans and those currently serving, getting financial backing is easy thanks to VA Mortgages. A VA mortgage is a housing loan offered to people who’ve been – or are currently – serving in America’s armed forces. The biggest perk of VA mortgages is that this investment property loan comes with no down payment requirements. Plus, they have very generous and lenient rates and terms. The applicant must be a veteran or currently serving in the army. They should reside in one of the rental units for not less than one year. Also, the property has to be ready for occupancy and approved by legitimate VA home appraisers. Obviously, there are other means that investors use to get investment property financing: These are just a few of the most common ones. That being said, what can you do to make sure you are on the safe side as far as investment property mortgaging is concerned? Research is key. It helps you to compare and contrast all available options then make a decision based on your facts. Consider making a large down payment. It can help reduce your interest rates. Make sure you read and understand the fine print. It will save you a lot of trouble and inconvenience in the future. Also, ensure you have at least six months’ worth of assets or cash. It gives lenders more incentive to loan you money. Stick to your budget. This ensures that your investment plan goes smoothly and as planned. There you have it. 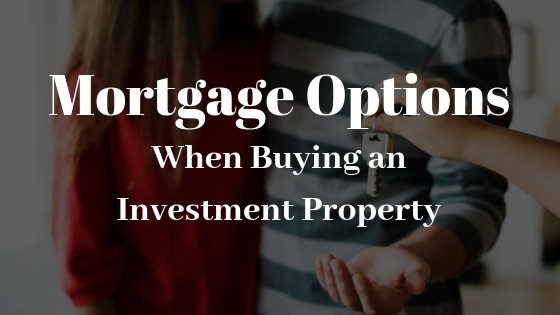 A quick run-down of what your mortgage options are when buying an investment property in Seattle, Washington. All you have to do is to figure out which one of the options above comes closest to your preferences, budget, and plans.